Have you ever had a friend disappear from your life, only to return at the most opportune moment? How can it be that I lost the friend who brought me to Minnesota in the first place over 20 years ago? And found her again in Berlin? The other day, before my family and I trekked over to the visa office, I was reading an article in the New York Times about how outraged Germans are that American intelligence has been tracking Angela Merkel’s phone calls. “Not a good day to be an American applicant for a German visa,” I thought, as I reached the bottom of the article. And who turned out to be the contributing reporter from Berlin? None other than my old friend Mel, a fellow rower on the Bucknell crew team. She and I moved to Minnesota together in 1992 and shared a small apartment in south Minneapolis after we finished school. She took off just three months later to study in Heidelberg, but by then I had a job and a place to live and a boyfriend, so I was committed to staying in Minnesota, my newly adopted home. She’s the one who showed the two of us around Heidelberg over spring break and took the brunt of the conductor’s wrath for not having stamped tram tickets during our visit. We have stayed in touch sporadically over the years, but more than 10 years have lapsed since our last contact. That was before social media, so we hadn’t reconnected through the modern channels that would have thrown us together sooner. All the more startling, then, to find her byline in arguably the best newspaper in the world, and discover not only that my friend has a thriving career, but that she surely lives somewhere close by. After reading that article, I tracked her down through LinkedIn and by Friday morning we were on the phone together, and her deep voice came through, same old Mel. She asked if we could meet this Sunday; I said I’d be rowing at the “Abrudern,” the closing of the season event, to which she replied with great enthusiasm, “Oh! Do you think I could join you?” And so it was; the American guest at the Ruderklub am Wannsee would be bringing her own guest. We met up at the Nikolassee S-Bahn station; both my S1 and her S7 lines intersect there. The trains were conspiring against me that morning; I’d never waited so long for a U7 nor an S1, and I was almost 15 minutes late for our appointment. The last few stops seemed to take forever but the delay made the reunion all the sweeter; is there anything more wonderful than rediscovering an old friend? Tears sprang to my eyes to see a friendly face from the old days on the train platform by the Wannsee, there to meet me. Together we walked the long streets to the water’s edge and caught up on each other’s lives. We were startled to learn that we have children at the same school. She has met women I row with at her yoga class. She’s been here for a full eight years, but we both realized the whole year could have easily slipped by without either of us realizing the other was here. By the time we arrived at the boathouse, everyone was gathered outside wearing their club colors, red and white, and they were organized organically by rowing program—youth in one cluster, women in another, men in their own huddle, the development team there as well, each group sorted like Montessori beads into their respective programs. Everyone knew their place and Mel and I soon found the women I know. “Abrudern” means the end of rowing, and there was much tradition and ceremony about it. First came the christening of the new boats. Three boats were lined up, an Empacher single, an Empacher double, and an acht-doppel-acht (octuplet), and there was also a new white coach’s launch in the water tied to the dock. Each of the boats had arrangements of fresh flowers attached to their sterns. The president of the club made a few statements about the year, then handed a glass of champagne to the German women’s champion. She talked about the single and how she has been rowing in it all season without a name, which is apparently bad luck, so she had taken to calling it “Mudda,” slang for the moms who had donated to buy this boat. I wouldn’t have understood her toast, but Mel kindly leaned over and translated for me. The acclaimed rower pulled off the Wannsee club flag and revealed the word “Mudda” emblazoned on the side of the single. She poured the champagne on the bow, then smashed the glass on the rigger, glass flying all over the boat and the patio. Everyone cheered. Next came Linus, a world-class rower, who said it’s customary to name a new boat after a place where a club rower has performed well to encourage the younger rowers to aspire to similar feats; he pulled off the flag to reveal that the new double was named “London.” More champagne spilled and glasses smashed. And so on, with the octuplet christened by a young boy, and the launch by an older man, possibly a coach. The place was starting to smell like a bar with all that alcohol settling into the ground. From there, everyone scattered to take their boats to the water, including the newly christened boats with the flowers still attached. At least 20 boats were launched, with 100 or so rowers now crossing the choppy Wannsee to enter the Kleine Wannsee for a morning row. The day was windy and much of our row was in terrible chop and driving wind. It was difficult to get a good stroke in, but eventually we rounded a bend and found a calmer stretch. After about 8 kilometers we turned and headed for the Griebnitsee ferry dock, where a treat awaited us. Four boats were already resting by this high dock normally used for passenger ferries. We didn’t disembark, but our stroke caught hold of a pier to anchor us, and a volunteer on the dock lowered a tray to us with cups of hot tea and rum. Next he passed down a handful of green gummy frogs for us to share. Lastly he gave us a stack of bread spread with “schmalz,” a fall treat which tastes like salty butter and is akin to lard. An odd combination for sure, and there was way too much rum for noon on a fairly empty stomach, but it was an amusing stop and a welcome treat. It was entertaining to resume our row after such a snack and see how our set and course was affected. We nearly rowed into a tree on the shore not long after that, but alcohol can’t entirely be blamed as the bow took her tea without rum. My friend A later told me that she had coxed a men’s eight for this row, and that one of the men convinced the man on the dock to hand them the half-full bottle, not just the tea cups. The rowers passed it around, and when they shoved off the bottle was returned to the dockmaster quite empty. Back to the boathouse we all went, the wind calmer now, though the last stretch across the wide Wannsee was rough like the sea with whitecaps rolling off peaks all around us. Thankfully the club is not far from the mouth of the protected Kleine Wannsee, so the trek through the waves was difficult but brief. We landed, put the boat away, and headed upstairs, where the club’s Ekonomie (café) was serving bowls of pea soup with wurst. Most of the rowers had large steins of beer as well. I opted for an apfelschorle. And I tell you, it was all delicious. Sitting in the wood-paneled Ekonomie with my old friend across the table, introducing her to new friends, enjoying traditional pea soup with a roomful of rowers, I felt an inkling of things falling into place. To have an old friend reappear in your life is a wonderful thing; to find one who shares your love of an esoteric sport all the better. She is the local resident who knows her way around, who is fluent in this difficult language, who is a working writer. It felt good to be able to introduce her to something new that’s been in her backyard all along—the Wannsee, and the peace that comes from rowing. 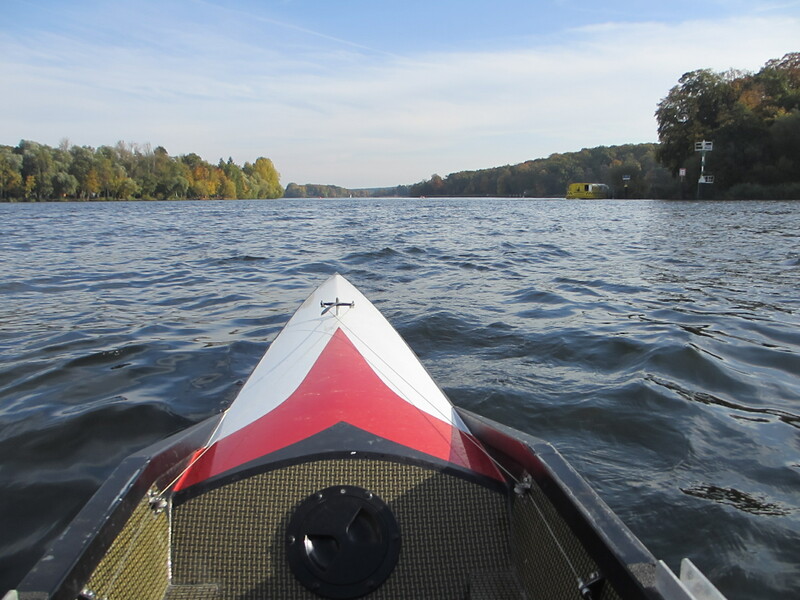 This entry was posted in Rowing and tagged apfelschorle, Berlin, boat christening, Bucknell University, London Olympics, octuplet, quael dich, Rowing, Ruderklub am Wannsee, schmalz on October 28, 2013 by Jill M.. Thanks, Merie! LinkedIn has brought me another lovely person in recent months, a favorite professor I’d also lost touch with. She mailed me her most recent book in a package covered with beautiful stamps. Made my day!